Little has been mentioned about the services needed for the barns. The water is a relatively simple affair as there is a connection just a meter outside of our land. Electricity should have been the same. Our neighbours are a well established charitable trust from whom we will access the electricity mains. However, when we made the application for the electricity with Western Power a year ago we were unaware that the charitable trust would expect compensation for allowing access known as 'an easement' across their land. This is known as a ransom strip. Western Power expected to make some concessions; replacing old infrastructure with up to date and so on. They were wholly unprepared for the land agent appointed by the charitable trust who came up with an easement compensation figure of £30,000. Naturally, we were somewhat taken aback by this. Maybe that's an understatement. We were thrown into a state of panic. The electricity connection was going to cost us about 12k plus the groundwork from the nearby electricity pole to bring the cabling up to the edge of our property. Now we expected to pay much much more than we had budgeted for and indeed more than our contingency allowed. The only thing we could do is appeal to the trust. This seemed like a sensible thing to do, however the trust only meets every 3 months and we only found out about this after the January meeting so we had to wait until the April one before we could even start to negotiate. Hah! Negotiate! They held all the cards. Anyway, we appealed to their charitable nature and eventually heard after the July meeting that they would accept less (in order to not bankrupt us), but with some extra concessions. These concessions transpired as replacement of the entire overhead cables, of a distance of 250m for which we have to do the ground works for. The groundworks are going to take a couple of weeks and will cost us about another 6-8k. It's all madness and a bit of a salutary lesson to anyone out there thinking of self building or barn converting. Check your access to the services early! This has caused such a lot of stress and it feels like there have been more down's than up's this year. These damn barns had better be worth it after all of this. We want our lives back! Hopefully, we'll be able to look back on this and think that it was all worth it. We returned from our holiday to find that the foundations had been dug but not filled with concrete. It did look as if they had found next doors water main pipe (!) as it runs underneath barn 3. It was a bit of an unknown as our neighbour believed that it ran under barn 2, but that was clearly not the case. Blogging has slipped by the wayside of late, although Instagram has filled a bit of an update gap as it is easy to take a photo and upload with just a couple of sentences, but now it’s time to post a more detailed update – anyway as I type it’s raining outside and I am on holiday. Barn 1 is largely unchanged as our contractor made the decision to wait until barn 2 reached roof level so that the roof could be done on both at the same time. This seemed an eminently sensible thing to do so we agreed without quibbling. However, it seems to have taken ages for barn 2 to get to rafter height. Every time rain stops play or our rather small building team are taken off to do a job somewhere else we have been kicking ourselves for not insisting on barn 1 being pushed to completion. Barn 2 has now reached roof height – hooray. The beam is in and the rafters, boarding out and insulation is being installed as I type. The final bit of brickwork where the roof level changes is also being finished. It has been slow……..very slow, but it looks absolutely fantastic! The layout is as envisioned, well actually it looks bigger than I imagined, which is clearly good news. And the upstairs bedrooms and bathrooms are much bigger than I thought they would be. It’s really hard to imagine it all when it’s just on a piece of paper. 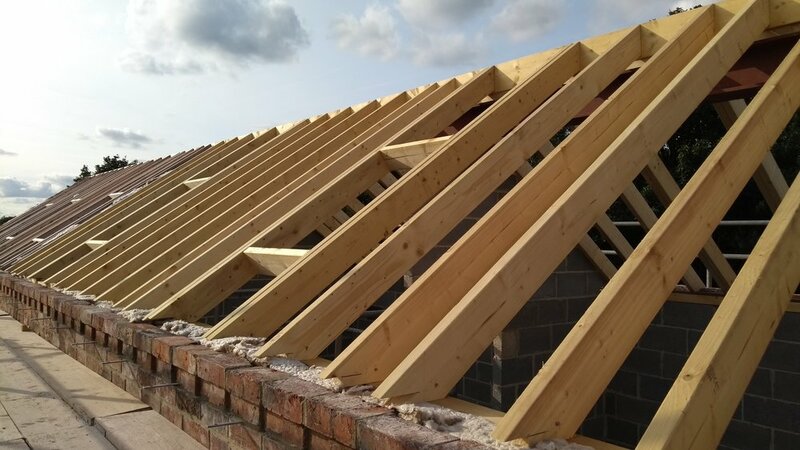 To be honest, we have largely been hoping that the room upstairs rooms were going to be nicely proportioned because we didn’t see the cross section plans and therefore the height of the roof until the ground floor was finished. We know that our architect (and builder) are very busy, but we seem to get the plans in a ‘not quite in time’ basis. 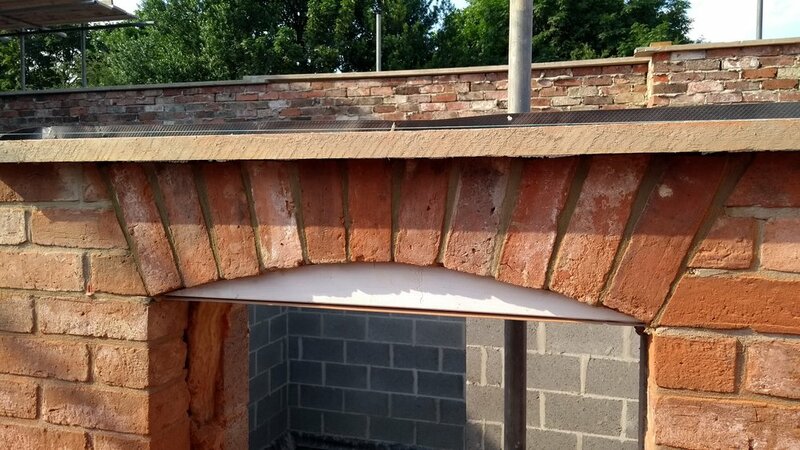 There seems to be quite a bit of judgement going into this build - thank heavens the brick layer is experienced (our hero), but it passes inspection at every stage and looks great so we are not complaining. We do need a bit of retrospective window altering to take place in the living room of barn 2 as they are set really high which is faithful to the original building, so I want at least 3 courses of bricks to be cut out of the base of each window. I don’t mind them being a little bit high so that they don’t impede on the layout of the furniture as it is quite a small lounge, but I think you need to be able to see out of them! Fortunately, there is a window on the front elevation in that room which is quite low so there will be a view out of this room. Barn 3 is on the move. 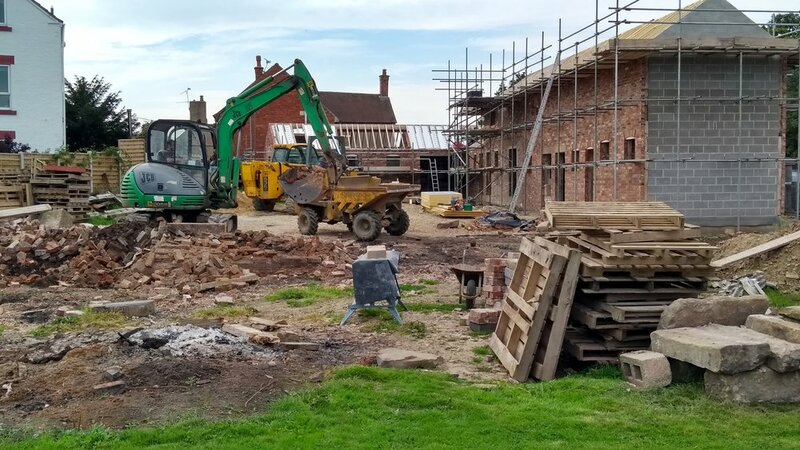 Well, not literally but the brick pile (which is still pretty huge) is being moved to the front of the barns so that the foundations can be dug. Whoop Whoop! A lot of bricks have been cleaned. Not by an army of brick cleaners, but mostly by Richard who is losing the will to bash another brick. And there are still so many of the flipping things. So where is the army of brick cleaners? We were promised a youngster who was going to earn some holiday money but he didn’t appear. The trouble is that it is too time consuming, dirty and elbow rattling to tempt any helpers, and we guess that our builder is looking at his budget before taking on anyone just yet and Richard is free! To be honest, we are leaving him to manage his budget and doing our best to chip in and help as any excessive cost on his budget will be passed to us and we want (need) our original quote to stand without getting any bigger. Check and re-check the plans against the building! The building is progressing for barn 2 but not without the odd hiccup. Due to a misunderstanding with the versions of the plans some of the joists were ordered incorrectly. This meant that more had to be ordered causing a week's delay to the first floor boarding out and consequently the continuation of the block and brick laying on the first floor. It's such a shame because the weather has been so good for building. We took the opportunity in the lull in building activity to have a good scout around in barn 1 by manoeuvring a ladder into place so that we could get into the first floor bedroom. We haven't been up there since before the rafters and boarding were fitted and barn 1 only has one first floor bedroom and en-suite, so is a small part of the building as a whole. We then discovered that one of the roof windows was in the wrong place. Again a later change to the plans hadn't been included so when the staircase was changed to bend around at the top of the stairs rather than just go straight up, it meant that the bathroom became a bit larger. Now the bathroom has an extra roof window and the stairs none! Fortunately, this is not a disaster because neither the roof or the windows have been fitted. Phew......we are so glad we checked now rather than later. The window lintels are looking great in plot 2 with a mixture of brick arches and original stone lintels. Bringing order to chaos, the pallets of cleaned bricks are getting bigger and the brick mountain is gradually getting smaller. The good news is that barn 2 is gradually growing but the not so good news is that there has been no further progress with barn 1. The plan is that the roof will be done on both 1 and 2 at the same time. The rain last week didn't help as the builders don't play in the rain. Today, however, the team have been at work in the beautiful July weather. Most notable today is that the cambered heads have been made and fitted ready for the brick arches over the windows. 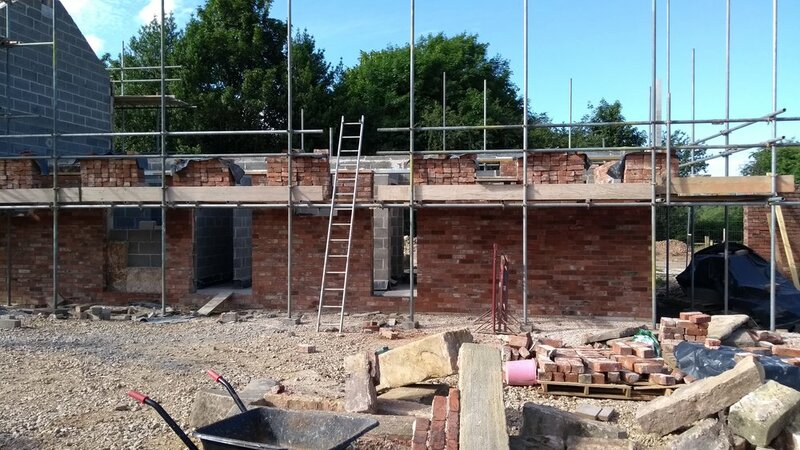 I'm looking forward to seeing these as the mixture of original stone lintels and brick arches really make it look interesting and of course are true to the original barns.